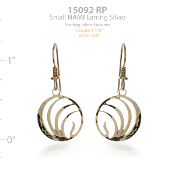 Support the San Mateo Chapter of NAMI (National Alliance on Mental Illness http://namisanmateo.org/) by purchasing these custom logo earrings, designed and made by Wild Bryde. Featured here in rhodium-plate, this style is also available in 14k gold-plate. Earwires are sterling silver and 14k gold-fill respectively.